The world’s social order ha been on fire for over 100 years. The reapers have been crying. These workers have been defrauded by the rich people who are at the top and in control. Brother Russell thought the destruction of the present heavens and earth might be completed shortly after 1914. In retrospect, we see all the destructive events that he spoke of have been coming in gradual waves or in labor pains of travail. With each spasm these labor pains have become more frequent and more severe, all leading to a fantastic climax. 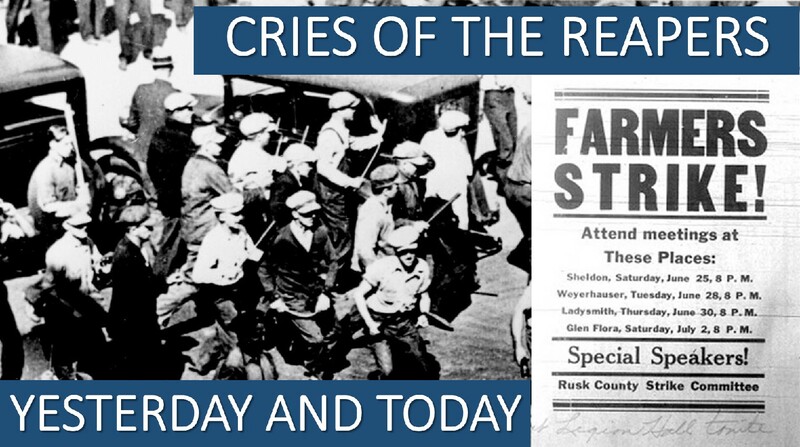 For over 100 years we have heard the cries of the reapers, of labor crying for fair wages and justice. 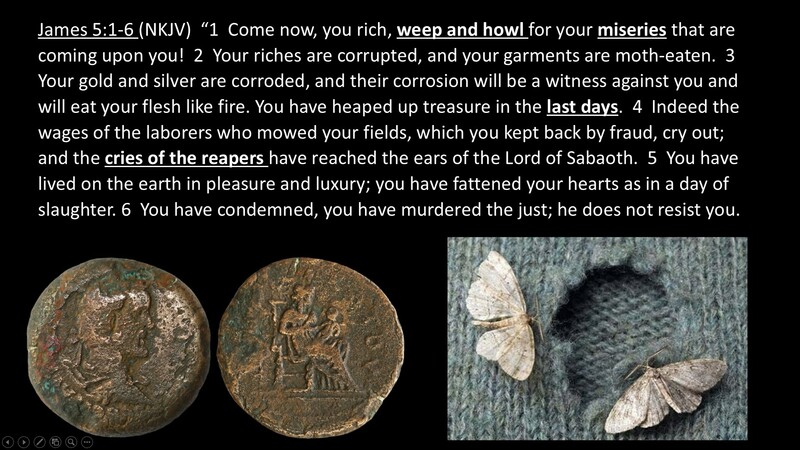 Notice in verse 3 that the timing of this punishment upon the rich are in the “last days.” The punishment of the rich will be so severe that they are described in verse 1 as weeping and howling in misery. Let’s consider the Bible history of money and lending. From as early as the time of Abraham, we learn that in history Gold and Silver were a prominent form of wealth. The Law of Moses allowed a lender to collect interest from a foreigner, but not from a brother, and especially not if he becomes poor. Exodus 22:25 (ESV) “If you lend money to any of my people with you who is poor, you shall not be like a moneylender to him, and you shall not exact interest from him. In Nehemiah chapter 5, Nehemiah stopped the wealthier Jews from charging interest on their poorer brothers who were at the point of being sold into slavery to pay off their debts. The idea of banks began as long ago as 1,800 BC in Babylon. In those days moneylenders made loans to people. In Greece and Rome banks made loans and accepted deposits. In Jesus day, the Temple money changers were robbing the people. 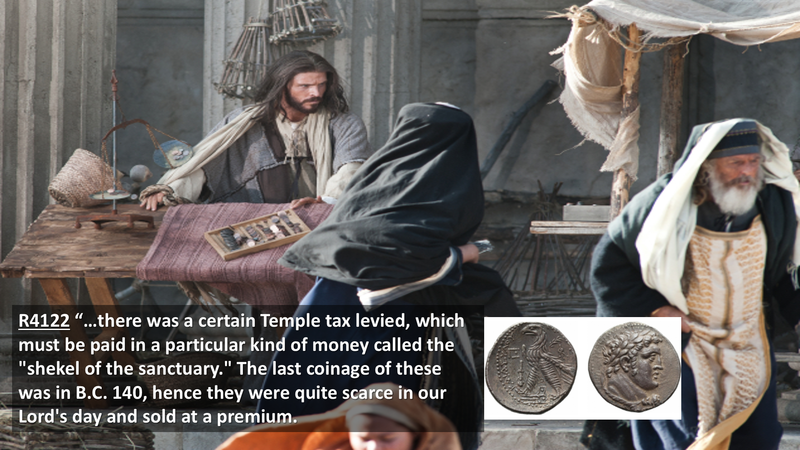 So in Jesus day, the greedy religious rulers set up a system whereby they could gouge the people through a form of religious extortion, placing a financial burden upon the people, forcing them to buy the expensive temple coin for their own gain and profit. To see how Fraud began 150 years ago CLICK ON THIS LINK and the follow the subsequent links to see how the big banks are even today committing fraud in the stock and bond markets. Will Gold and Silver become worthless? Ezek. 7:19 (NKJV) ‘They will throw their silver into the streets, And their gold will be like refuse; Their silver and their gold will not be able to deliver them In the day of the wrath of the LORD; They will not satisfy their souls, Nor fill their stomachs, Because it became their stumbling block of iniquity. Zephaniah is talking about punishing the wicked merchants who handle money. Watchtower Reprint # 2384: “They shall cast their silver in the streets, and their gold shall be removed: their silver and their gold shall not be able to deliver them in the day of the wrath of the Lord.” – Ezek. 7:19; Zeph. 1:18. So Brother Russell was not suggesting here that Miller Bartella’s fortune was worthless, but rather that the mob was so angry at him for his usery, that no amount of money could keep them from killing him. And so in future anarchy, people will be so angry at the rich, that no amount of gold and silver will deliver them. These verses then may actually then imply that gold and silver will have great worth. Another way of looking at this is that there is no way for the Bible to describe stocks, bonds, fiat currencies and derivatives, all of which did not exist in Bible times. If we think of gold and silver as wealth, we can think of the wealth of the rich becoming worthless, that wealth being not literal silver and gold so much as stocks, bonds, fiat currencies and derivatives. In agreement with that, the scriptures teach that the gentiles will bring their wealth of gold and silver to Israel. Zechariah 14:14 (NKJV) “And the wealth of all the surrounding nations shall be gathered together: Gold, silver, and apparel in great abundance. Gold and Silver have been considered as wealth for thousands of years and will continue to be considered as wealth in the kingdom. The bankers were not just manipulating the price of precious metals in Brother Russell’s day. They have been doing it ever since, even today… and we suggest it will come back to bite them, which will be a fitting retribution. How have the bankers been manipulating the price of gold and silver and why? They manipulate the price of precious metals down so that they can buy them cheap and so that people will be more attracted to the Fiat Currencies and inflated third party paper assets like stocks, bonds, securities and derivatives. All fiat currencies in history have eventually become worthless. These Rich Men at the top manipulate the stock market so that they can steal wealth from the middle class in sudden stock market crashes. CLICK ON THIS LINK TO FIND OUT MORE. What is meant in ? We suggest this means that Gold and Silver will destroy evil rich men, by destroying the world’s counterfeit money, the fiat currencies with stocks and bonds. Let me explain. This idea of gold and silver corroded illustrates corruption through fraud in their manipulation of investments in silver and gold. According to James chapter 5, their corruption 1) will be a witness against them and 2) eat their flesh. In other words, the means of their fraud will ultimately be their undoing. This manipulation of the price of gold and silver will become the means of their own destruction. You might say, poetic justice or well-deserved retribution. The very gold and silver they corrupted will destroy them. How will gold and silver “eat the flesh of” or destroy the evil rich men? When people lose faith in stocks, bonds and fiat currency, they will panic, looking for a safe place for their money. Precious metals will seem like the safest, yet with so many people trying to buy it the price of Gold and Silver will shoot to the moon, thereby accelerating the destruction of the value the third party paper assets, namely stocks, bonds and fiat currencies. This will destroy the wealth and the power of the rich. In angry revolt, the people will end the banking system and the rich will no longer be able to steal the wealth from the people. Our idea may not be exactly correct, but we leave it as food for thought. Perhaps it will stimulate a better explanation and comments from each of you. THE RICH GUILTY OF FRAUD, MURDER AND FALSE CONDEMNATION. It is interesting how these three crimes line up with Satan’s attributes. Fraud – Jesus describes Satan as the “father of lies” John 8:44. Murder – Jesus describes Satan as “a murderer from the beginning” John 8:44. These attributes which so closely align with Satan’s own attributes are evidence of the evil in these rich being condemned. The verse 6 reference to condemning and murdering the just reminds of us Jesus before his accusers, and then also the persecuted Church of the Dark Ages. Who have these rich condemned and murdered in our lifetime? Since they own and control the legacy main stream news media, these crimes have probably either been ignored or when brought to light labeled as conspiracy theories. The Lord has a horrible punishment planned for this wicked rich men. When they are eventually resurrected in the kingdom, they will have to live with the shame and embarrassment of the whole world being disgusted with their evil. Many of them are so evil that we cannot know if even the kingdom can draw them to repentance and save them. Bible students are protected to avoid any reliance on this world financial system since it is phrophsied to fall after the fall of false religion Babylon the great just prior to Christ return and the start of the great tribulation, as discribed above avoid trust in this money system the third part of Satan system. Political, religious and commercial deserve Jehovah’s punishment . At that time Christ will choose the ‘faithful and discreet slave doing his will’ this is when the slave is chosen so those religious organisation believe they are this slave they need to be aware that Christ will inspect their behaviour, if they beat their brothers then this is a disqualification one of the qualities of the slave assigned as the evil slave Mth24:45-51. Germany suffered the 1929 depression money was worthless, Germany was foretold by Daniel to be the King of the North in these times the nation that would spark Armageddon invading the Middle East to finish of Israel. In WW2 she tried to kill all fleshly Jews on her continent, only the Allies US and British speaking countries the the Young Lions make up the King of the South who would stop the King twice both in WW1 and WW2 but this time this super King Germany the leader of EU has trapped Britain in EU. Next her attack will be unstoppable so only Christ himself can save his spiritual people and his fleshly people in the state of Israel. This is why Brext is a really important issue, although not realised by most people’s and Christians alike. I never read these Scriptures from this perspective but after reading the above about gold and silver, I watched Fox News on YouTube and guess what? An advert on investing in gold, then another on silver! Coincidence or what? With Adobe Connect it might be a bit difficult to create a downloadable link. I’ll be with Br. Peter and some other techs this weekend. There may be a way to do it, but it would requite a bit of work. Would an MP3 suffice? That would be much easier to manage. Yes, even an mp3 would be wonderful. I had considered making an mp3 of it myself. Did you want to do it? Or shall I? Are you able to get an MP3 made? I can post it once you do that. Just send to my email address at Gmail. Can someone please confirm: Was there at one time also a downloadable link to this video (for offline viewing)? And is there any chance that Br. Peter made his powerpoint presentation available? I just emailed you the PowerPoint from my Gmail account. It links to Google Drive for you to download. And thanks also for the copious amount of work I can imagine you put into it.